Individual pots or large beds? It doesn’t matter. The requirements for rooting cuttings are the same. Good drainage, enough depth for five or six inches of rooting media, and a canopy or tent to hold humidity. In theory, when these requirements are met, we can forget about our cuttings until they root. They don’t need us to do their work. 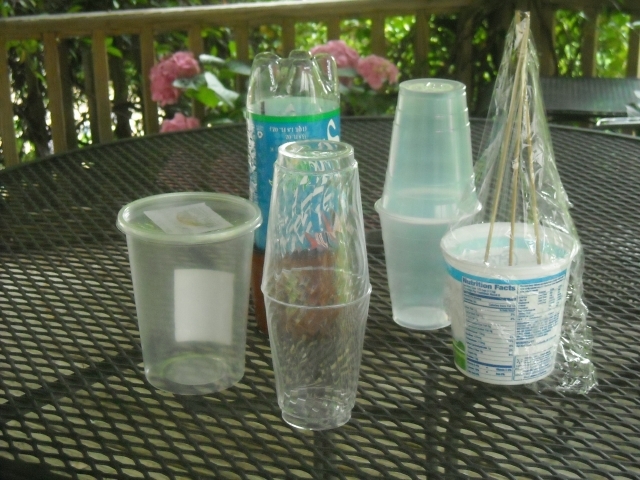 Flower pots with soda-bottle cloches. Plastic containers from prepared food. Wooden produce boxes covered with plastic film. Six-pack styrofoam coolers. Nursery trays with high domes. Yogurt containers with saran-wrap tents. Clear solo cups taped together. Gallon jugs modified for planting. All these can be shelters for rooted cuttings. Best of all are large biscotti containers. They are deep and roomy with snug but easily removed lids. It is remarkably pleasant to empty their contents. Guilt-free, too, because it’s all for a noble cause. In my early adventures with propagation I didn’t comb grocery stores for bargains in food. I scouted for pots. Be sure containers are clean. Punch holes in the bottom for drainage. Space cuttings so leaves don’t touch other leaves or any surface. Choose tents that open easily for air circulation or spritzing if humidity seems low. Support plastic film with stakes to keep it above cuttings. 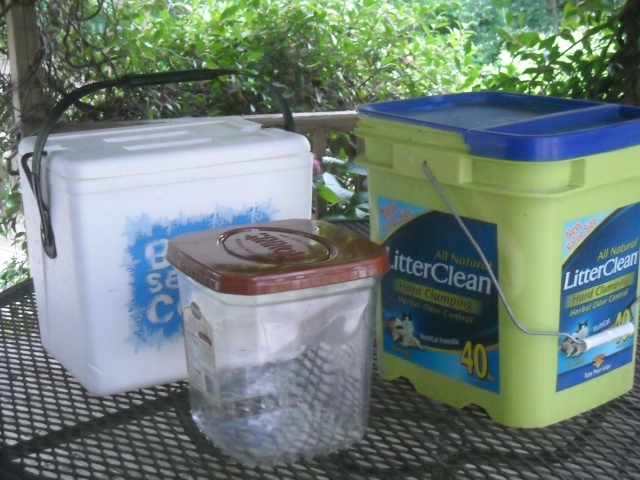 Keep containers in a shady spot with good drainage. Can be moved around easily. Good for rooting just a few plants. Number of cuttings must be limited to prevent overcrowding. Several cuttings from one plant can be grouped and treated similarly. Roots of single cuttings are contained, plants are easy to lift and transplant. Soil tends to dry out more quickly, may need supplementary watering. Easy to add bottom heat with old heating pads covered with plastic. When we became propagation addicts, we needed more territory to maintain our highs. 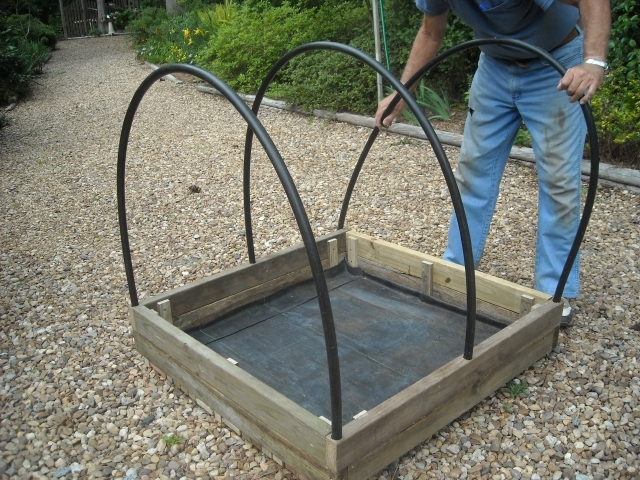 Today we have not one, not two, but several large beds with potting media of various sorts. We use them for sowing seeds we’ve collected, housing orphaned or sick plants, growing ferns, raising biennials and wild flowers and, of course, propagating stem cuttings. How could Farmer MacGregor get so angry at such a sweetie? I think I know. This sounds like a highly organized operation, but the whole affair is pretty spontaneous and informal and depends entirely on space available for a needy plant. Sometimes the beds look like Garden Beautiful; other times they are a mess. Sometimes everything grows. Sometimes only the weeds. 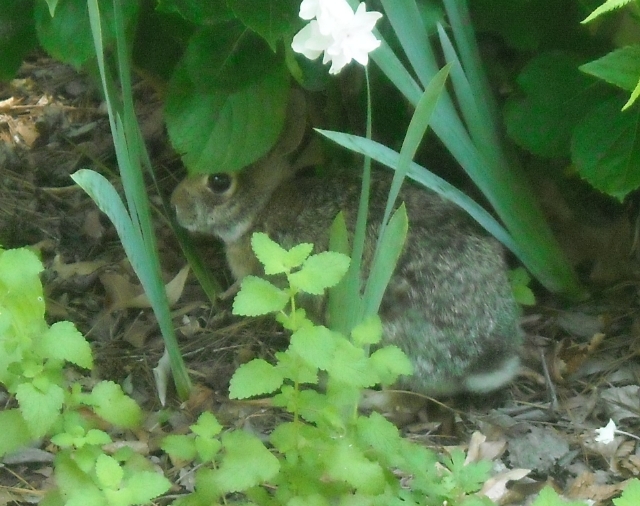 Sometimes acrobatic baby rabbits scramble up swaying lily stems to feast. Or a deer may need tender shoots for dessert. 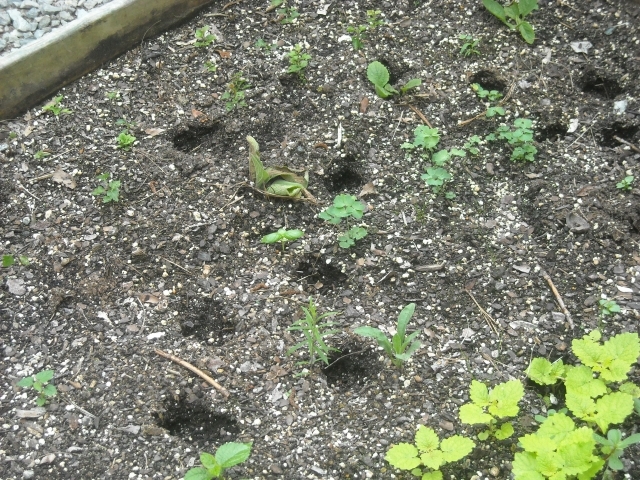 Can anyone identify these heffalump footprints and, incidentally, trampled a young dwarf butterfly bush I was nurturing? Once a bobcat used one of the beds as a litterbox. Recently an unidentified herd of heffalumps tromped through, stepping on seedlings and trampling shrubs. If anyone knows their whereabouts, we’d love to hear from you. It’s one grand, unpredictable experiment. Choosing the site: A shady area that is level and convenient to get at with enough space for working around is best. Consider this to be a fairly permanent installation. Good drainage is key to successful propagation. If the box is set directly on the ground, the media will remain too moist. We set the box on a 4-inch layer of drainage rock. A few inches of sand underneath the box would also work, but there is less tendency for tree roots to invade if coarse rocks are used. Building the box: We use pressure-treated 2″ x 6″ lumber. We prefer not to use chemicals in the garden, but our research on treated lumber has turned up no evidence of chemicals leaching into the soil. The boxes remain in fine shape to this day, despite exposure to constant moisture for about fifteen years. A 2’ x 2’ bed requires one 8-foot-long 2″ by 6″ board cut into four equal lengths. A 4’ x 4’ bed requires two 8-foot 2 x 6’s, each cut into four-foot lengths. 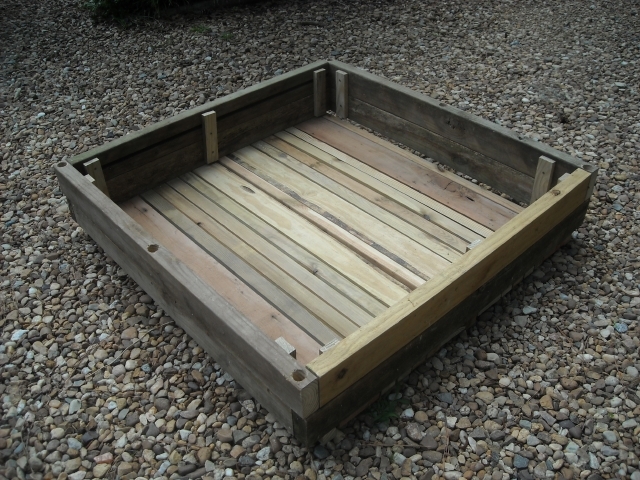 A 4’ x 8’ bed requires three 8′ 2 x 6’s, one of which is cut in half to make the ends. Of course, the box can be any size you want, but there is no lumber wasted when you use these sizes. Home improvement companies will make necessary cuts for nominal cost. Beds wider than four feet are impractical unless you have very long arms and a strong back for bending. Screw or nail the boards together with galvanized hardware at least three inches long. Providing for the tent: Starting at the corners, drill one-inch holes along the top edges of each box as follows: 2 or 3 holes in two sides of the 2 x 2 box, 3 holes in two sides of the 4 x 4 box, and 5 holes in the eight-foot sides of the 4 x 8 box. Holes should be equi-distant from each other and should be about 3 or 4 inches deep. When drilling holes at the end of the bed, be sure to avoid the screws. For this reason, it’s a good idea to begin drilling 2 inches in from the end. Making the bows that support the tent: For a four-foot-wide bed, cut three-quarter inch diameter black plastic/poly tubing into about 96-inch lengths and slip these into the holes. You can experiment with lengths. We find that shorter tubing makes working in the bed inconvenient. Longer tubing creates a more spacious tent but humidity can be lost. Bows can be installed after bed is filled with rooting media. 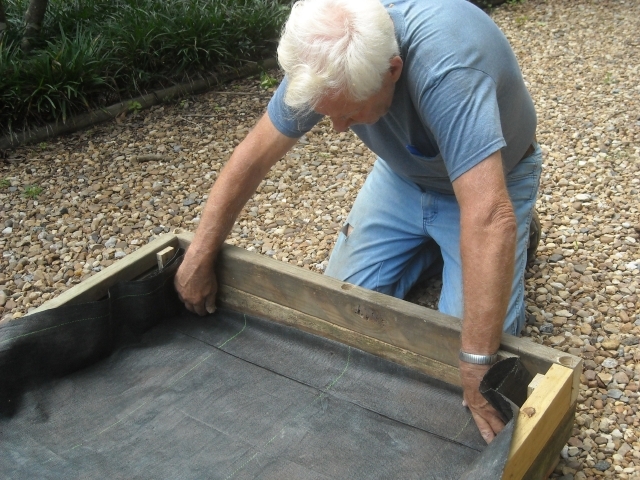 Installing the landscape cloth: Set the box in its final location. 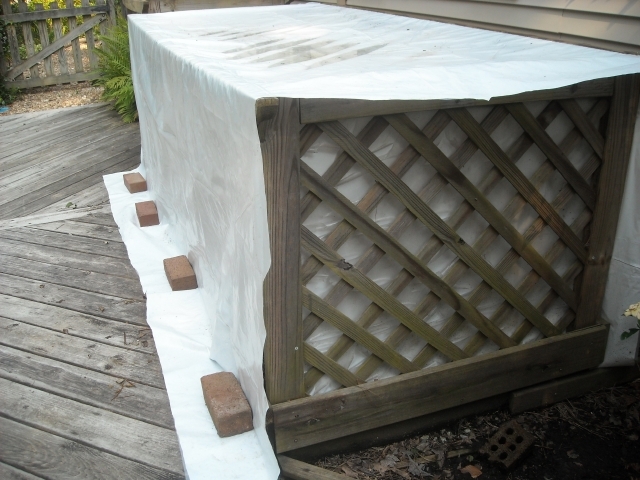 Cover the sand or drainage rock with landscape cloth and staple it to the sides of the box to keep media in and let water drain. Landscape cloth is commonly four feet wide, so the ends of the box should be 45 inches wide at most. Otherwise, cloth will need to be pieced. 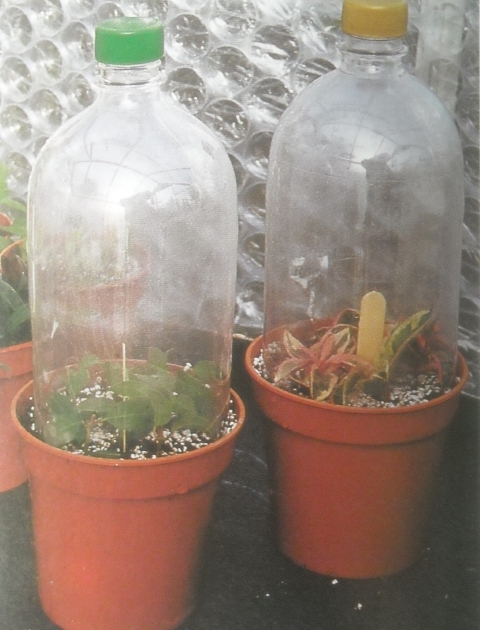 Choosing the plastic: Cuttings do best in limited light. We cover the frame with 6 to 8 mil white plastic that casts about 50 percent shade. Our box, once shaded by tall trees, is now in full sun. 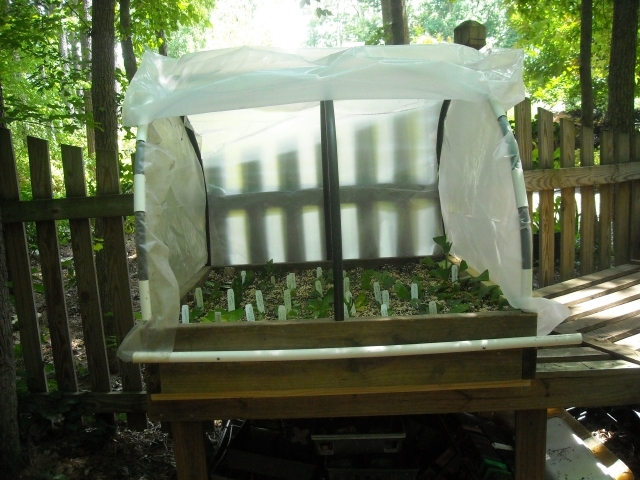 In the hottest months we drape a layer of shade cloth on the plastic to help keep the bed cool. The shade cloth is removed once weather cools. Attaching the plastic: Measure enough plastic so it can drape over the frame easily with a few inches excess on the ground on sides and ends. If plastic is not long enough to cover ends, we cut separate pieces and attach to end bows with greenhouse clips. We use bricks to anchor the plastic to the ground. Plastic will sometimes sag between bows. If you wish, before you drape the plastic over the frame, fasten a 1 x 2 under the top of the hoops with 8-inch plastic cable ties, often called “zip ties.” Length of the 1 x 2 is determined by the length of the box. 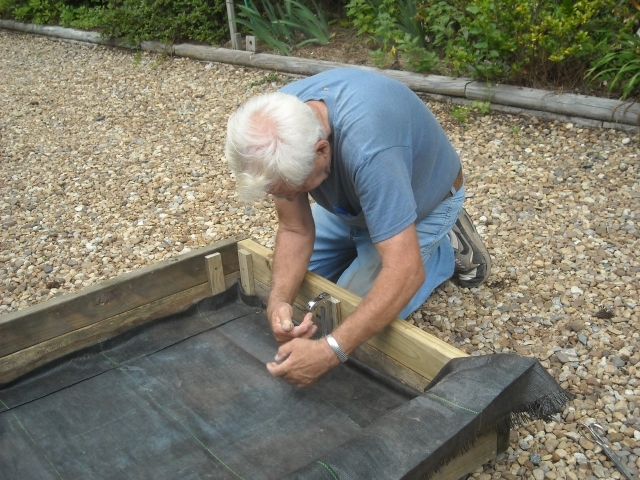 After positioning the plastic over the frame, hold it in place with greenhouse clips. We’ve found the best source of greenhouse clips to be Pinetree Garden Seeds, catalog or online. Filling the box: Before bows and plastic are installed, spread the media as evenly as possible, working it well into the edges. We use a board about four feet long to level the media. Significant costs and energy are involved in construction. Installation is relatively permanent, so site must be chosen carefully. If using shade from trees, roots may invade the box. Site conditions can change, requiring modifications to the set-up. 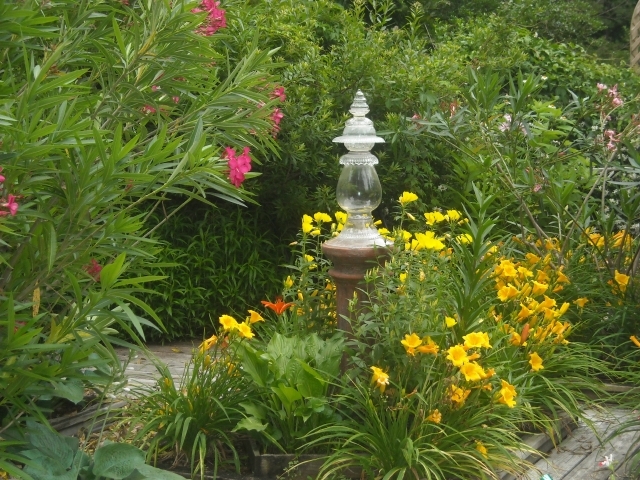 Moisture in the large volume of soil is easy to maintain. Roots can wander or tangle occasionally; plants may shock when repotted. Options can be added if a source of electricity is nearby. Misters can be installed to increase humidity. 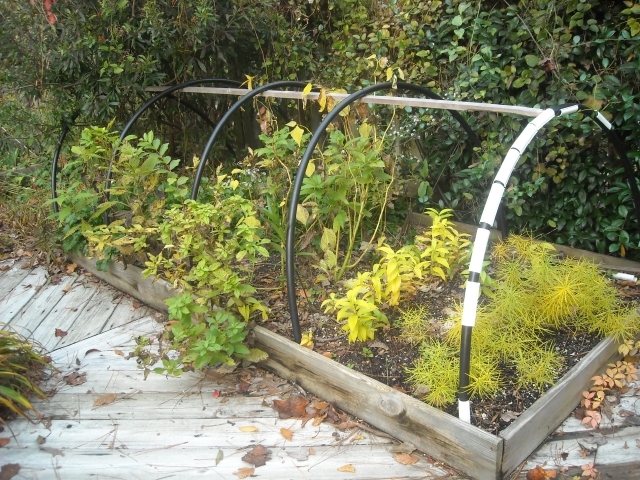 Heating cables can promote rooting during cool weather. One winter we emptied the bed of spent media and installed an electric heating cable with a thermostat. We laid the cable on top of the landscape cloth and put a layer of wire mesh, or hardware cloth, over the cable to prevent damage from digging. The heated soil promoted vigorous root growth during cool weather. When soil warmed up we temporarily discontinued use. When the cable broke, that was the end of that experiment. We experimented with misters for a while, timing them to run a few seconds three times a day. Misters keep humidity high, but even with limited use, our rooting media seemed to become too wet. Tiny mister nozzles became clogged with minerals in our water and had to be cleaned by soaking in vinegar. So that was the end of that experiment. Our best rooting bed had to be modified after storms felled shade trees and left it in full sun. A shade cloth goes over it in summer. It was all too much work. It’s a lot easier to follow the weather when rooting cuttings, or spritz them, if they need it, with a five-dollar spray bottle. Shooting a burst of spray from a wand aimed upward toward the dome of the tent is effective, too. If all things are in balance, additional moisture should rarely be needed. Our low-tech propagation for fun is a bit of an art, not hard science. There are no guarantees, but when we succeed, it’s like Christmas in July. Soilless Media? Choosing Candidates Small Pots or Large Beds?